PLANO, Texas, and MADRID, Spain, May 16, 2018 /PRNewswire/ – Pizza Hut, a division of Yum! Brands, Inc. (NYSE: YUM) and the world’s largest pizza restaurant company with nearly 17,000 restaurants in over 100 countries, and Telepizza Group (BME: TPZ), the largest non-U.S. pizza delivery company worldwide with more than 1,600 stores in over 20 countries, today announced a strategic deal and master franchise alliance to accelerate growth across Latin America (excluding Brazil), the Caribbean, Spain (including Andorra), Portugal and Switzerland. This landmark deal moves Pizza Hut to the number one position in the category across Latin America and the Caribbean in terms of unit count. Across all the markets covered in the alliance, Telepizza Group will oversee nearly 1,000 Pizza Huts and contribute nearly 1,500 of its stores to Pizza Hut’s global unit count. Pizza Hut International franchisees in these regions will continue to operate their businesses, under the management of Telepizza as a Pizza Hut master franchisee. This strategic deal is a long-term initiative by Pizza Hut expected to result in accelerated unit development and operating profit growth on what will be a combined initial unit count of nearly 2,500 stores. The transaction is not expected to have a significant impact on Yum! Brands’ core operating results or cash flows over the next few years. 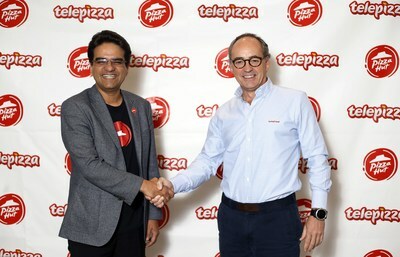 Telepizza Group, headquartered in Madrid, operates in 23 countries with Telepizza and Jeno’s Pizza brands, among others, and celebrates 30 years with over 60 million of pizzas delivered worldwide. The Company manages a total network of 1,607 stores including 441 owned stores and 1,166 franchisees and master franchisees (as of 31 December, 2017) and is the leading player by number of stores in Spain, Portugal, Chile and Colombia. Total sales in its network, including own stores, franchisees and master franchisees, recorded as chain sales, amounted €561.6 million euro in the 12 months ended December 31, 2017. Telepizza Group is listed in the Barcelona, Bilbao, Madrid and Valencia stock exchanges with its shares starting trading on April 27, 2016. Information regarding the impact of the Tax Cuts and Jobs Act of 2017 (”Tax Legislation”) consists of preliminary estimates which are forward-looking statements and are subject to change. Information regarding the impact of Tax Legislation is based on our current calculations, as well our current interpretations, assumptions and expectations relating to Tax Legislation, which are subject to further ongoing change.